Bed Bugs, who's common name comes from it's preferred habitat, are small parasitic insects that feed solely upon the blood of warm-blooded animals. They range in size from about the size of a poppy seed as hatchlings, to about a 1/4 of an inch in length as adults. They are oval in shape and flat, they range in color from nearly white (when molting) to dark brown. While Bed Bugs have not been known to transmit any infectious agents, their bites may cause a mild allergic reaction. Repeated bites can cause a person to be sensitized at which point additional bites may result in a more intense allergic reaction. And while bed bugs are mainly nocturnal, when hungry, they've been known to come out during the day looking for a host to feed on. Until recent years, a large number of our population was unaware that the common bed bug existed. Bed Bugs were the topic only in fairy tale stories and expressions. But In fact, bed bugs were common in the first half of the 20th century. Widespread use of pesticides such as DDT and improvements in hygiene during the 40s and ‘50s lead to their dramatic decline. However, during that time, the pests remained fairly prevalent in other countries and other regions of the world. In recent years, the bed bugs have also made a comeback in the U.S. and the district has seen a resurgence of them. So why the resurgence? The University of Kentucky speculates that Immigration and international travel Along with a change in modern pest control practices (less effective bed bug pesticides) have undoubtedly contributed to the resurgence of bed bugs in the U.S.
How Do I Know if I have Bed Bugs and How Do I Check? Because they feed on humans, bed bugs can be found in and around mattresses, sofas, and other furniture. They congregate and hide within the cracks and crevices of furniture but most often they're found in mattresses, box springs, bed frames and headboards. As you look for an infestation, pay particular attention to dark spots of dried waste that are often present along mattress seams. Look for the bugs themselves, and the light-brown, molted skins of the nymphs. Checking for bed bugs can be a tedious process since often times it requires the dismantling and moving of furniture. However, a thorough inspection can be crucial to finding an infestation, especially in the early stages. Items such as mattresses, headboards, dressers, and sofas should all be dismantled and over turned to visibly inspect hard to see areas. Box springs should be visually inspected underneath where the fabric is stapled to the wooden frame as this is a favorite place for the bed bugs to hide. Nightstands and dressers should be emptied and examined inside and out, then tipped over to inspect the woodwork underneath. When inspecting chairs and sofas, be sure to inspect not only the cushions and seams above but also the fabric beneath. Chances are you picked up the bugs from another infested area. Bed bugs can be transported very easily in or on such things as luggage, clothing, beds, furniture, or other items traveling items. As mentioned earlier, they are small and their eggs are even smaller. They can be easily carried in on a person’s clothing, shoes, or overlooked when transporting items from one place to another. Purchasing or acquiring secondhand beds, couches and furniture can be sources of an infestation. For further assistance you may contact our office by using our contact page or by calling (860) 745-0383. Inspect used furniture, TV’s, linens, cloths, boxes, etc. before you purchasing. Refrain from picking up furniture (including mattresses, clothes etc.) off the street. Inspect gifted furniture, luggage, clothing etc. whether they come from a personal acquaintance or not. Inspect Items from self storage facilities or items carried in rental, delivery or moving trucks, before bringing them into the home. And inspect rented furniture from rental furniture centers before accepting deliveries. In 2013, Connecticut became the first state to pass comprehensive mattress recycling legislation. Connecticut’s Public Act 13-42 (enacted in 2013 and amended in 2014) required the mattress industry to create a statewide recycling program for mattresses discarded in the state. The Program is funded through a recycling fee collected from consumers at retail when a mattress or box spring is sold. The Mattress Recycling Council (MRC), a non-profit organization established by the mattress industry, created and manages the Program. The Connecticut Mattress Stewardship Program, approved by the Department of Energy & Environment Protection, requires a $9 recycling fee on all mattresses and box springs sold in the state. The fee will begin to be collected starting May 1, 2015 in addition to recycling services beginning. Visit http://www.byebyemattress.com/recycling-locator/ to find out where you can dispose of a mattress nearest to where you live. As you might guess, bed bugs can be a problem for places such as hotels, motels, and apartment complexes where the turnover of occupants is constant. If you're a frequent traveler staying in Hotels/Motels or live in an apartment complex, remain vigilant. 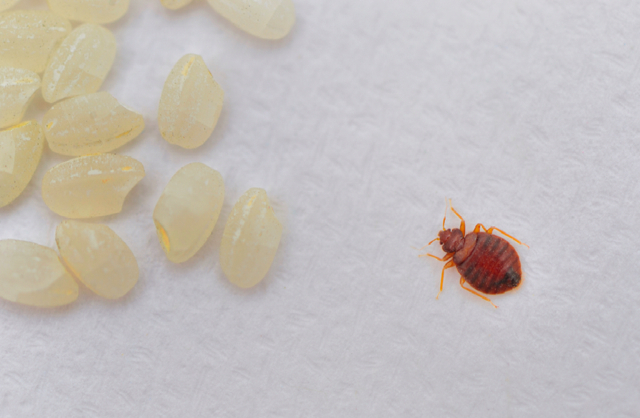 Frequent travelers should routinely check furniture and bedding for signs of bed bugs. This would entail examining the bed sheets and upper and lower seams of the mattress and box spring, especially along the head of the bed. Some professionals also suggest removal and examination behind the headboard, a frequent hiding place for the bugs in hotel rooms. Headboards are heavy and cumbersome, however, and untrained persons should not attempt removal themselves. If bed bugs are discovered, travelers can request another room, preferably in another area of the building. Vigilant travelers may also want to elevate suitcases off the floor on a luggage stand, tabletop or other hard surface. Should travelers experience itchy welts suggestive of bed bug bites during their stay, it would be prudent upon returning home (before unpacking) to place all clothing in disposable plastic bags and directly into the washer and/or dryer. Inspecting or vacuuming luggage upon arrival home is less useful since it’s hard to spot bed bugs inside a suitcase. The suitcase itself can either be treated or discarded. Bed bugs are not everywhere! Only a small number of travelers will encounter bed bugs. Vacationers should keep the problem in perspective. By following a few simple precautions, the possibility of getting bed bugs can be greatly reduced.